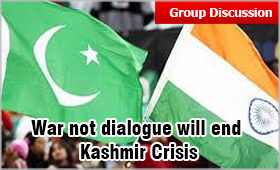 War Kashmir Crisis: War not dialogue will end the Crisis? For the last 60 years, since independence in 1947, the issue of Kashmir has been the bone of contention in the Indo-Pak relations. Both India and Pakistan lay their claims that Kashmir which includes the Pakistan Occupied Kashmir part, Jammu, Leh and Laddakh and Kashmir valley are their territory. In the name of religion terrorists in Kashmir have been spreading hatred, violence and are killing innocent people in Kashmir to get it separated from India. Quite recently evidences that separatist and terrorist leaders are being funded by Pakistan have been unearthed. India despite maintaining restraint to a great extent now needs to resolve this issue once for all to end the crisis. How to resolve this issue of Kashmir? This has become the hot debatable topic for discussion at every forum. In their GD round for final MBA/PGDM admission process, B-schools have also included this topic to bring out the discussion skills of the candidates. A good area of Jammu & Kashmir was invaded by Pakistan in 1948 and is still controlled by it. Out of this illegally occupied area, Pakistan has gifted a part of it to China. Pakistan’s calls its occupied area of Kashmir as Azad Kashmir while India terms it Pakistan Occupied Kashmir (PoK). UNO intervened and asked Pakistan to withdraw all the invaders and forces from PoK and conduct Plebiscite as the first step which Pakistan has not done so far. In order to get control of full territory of Jammu and Kashmir including which is with India, Pakistan has been training and sending the groups of terrorists to create unrest, terrorise Kashmiri people, kill innocent people and instigate them against India. All this is funded through various means by Pakistan. Till 1989 things were not so bad. However when Mufti Mohd. Sayeed was the home Minister of India, his daughter Rubaiya Sayeed was kidnapped by terrorists. She was released only after the release of 5 dreaded terrorists. This incident spurred terrorist activities and violence in the Kashmir valley and terrorists found the Indian Government, innocent people and families of the VIPs a soft target to make them bow down to their demands. Thousands of Non-Muslim families of Kashmiri people were tortured and were made to flee Kashmir. The night of January 19, 1990 is still a nightmare for these people. The exiled Kashmiris by their Muslim brethren are still in trauma and are living in make shift camps in Jammu, Delhi and other parts of the country for the last 27 years. India, despite lot of restraint and facing the treacherous Kargil war is still contemplating how to end the crisis now. The present Home Minister of India Mr. Raj Nath Singh proposes to find the permanent solution to Kashmir problem but does not reveal how it is proposed to be ended. While the war could be the one way but its efficacy to become the permanent solution may be doubtful. Besides, loss of lives, property, and the prime concern of building the progress path of Kashmir would get severe setback. Getting stuck to the path of dialogue and discussions to end Kashmir crisis has also not yielded any fruitful result and terrorists from different quarters find it easy also to make quick money out of their activities. They are offered money with the prime objective to create terror and fear in Kashmir so that Kashmiris do not march on the path of progress. It has been more than 50 years since we have been talking to Pakistan on Kashmir Issue. We have fought wars in 1948, 1965, 1971, 1999 with Pakistan and every time have observed restraint. Indian may now warn Pakistan to stay away from Kashmir and then wage a full fledged attack on it and also take back its claimed Pakistan Occupied Kashmir territory. Pakistan is resorting to the systematic destruction of the historical culture of ’Kashmiriyat'. The fact that Pakistan usurped a part of Kashmir and donated a chunk of it to China is undisputed. Pakistan talks about freedom of Kashmiris in India, but shies away from the fact that in Pak Occupied Kashmir, there is no semblance any freedom or rights of Kashmiris. India therefore should press upon Pakistan to have referendum in its PoK area. If it does not fight it out to resolve the issue permenantly without acceding to the Pak request to return the claimed Indian area at any cost. It is true that Pakistan takes undue benefit of India’s soft stand. Even after winning the wars, India has returned the captured territory to Pakistan. This time it should be clarified to Pakistan that the captured PoK would not be given back. Kashmir is wanted by Pakistan as it can provide fertile for terrorist organisations and will be the best way to infiltrate into India. Today Kashmir valley stands as a very strong wall that Pakistan finds very difficult to break through into India. To protect its integrity India has already lost many soldiers butchered by Pakistan in most cruel some way. There is no need to continue the dialogue but claim the PoK back through War. Kashmir is also an important and only link between Afghanistan and India. This not only helps us build strong relations with Afghanistan but is seen as a threat by Pakistan who also has sour relations with Afghanistan. The attack on Pakistan will clarify and convey the message to it to keep away from sponsoring terrorism in India or Afghanistan. Pakistan had even offered to give up East Pakistan in 1950s, in return for Jammu and Kashmir on the sidelines of official discussions with India. The territory is needed by Pakistan not for religion or Kashmiris. It is much deeper than that and may not be sorted out without war. Pakistan sponsors terrorism to get Kashmir. It is not that simple. Pakistan kept the Kashmir flame burning until the 1990s to meet their ends, when China conceived the CPEC and decided to take over. China has a huge geographic handicap: no access to southern world oceans. On the Karakoram highway, this is where it matters most for India. It connects China and Pakistan, through India, through Jammu and Kashmir which legally acceded to India in 1947 October. Gilgit Baltistan area of Jammu and Kashmir state, which legally belongs to India is illegally occupied by Pakistan. China also occupies illegally the eastern and northern part of Jammu and Kashmir - Shaksgam valley (gifted by Pakistan in 1960s) and Aksai Chin (occupied by China in 1950s when it annexed Tibet). Pakistan is trying to penetrate into India through China. In fact, China is using Pakistan for its own benefit and is indirectly funding the terrorism through Pakistan but Pakistan keeping its eyes closed is playing in the hands of China. The only way left now is to kill and crush to end the crisis. War could not be the permanent solution to Kashmir Crisis as it will result in loss of lives and property to a great extent and will leave sour areas that would redevelop again in a few years. Calling off the dialogue process with Pakistan could be an ill-advised decision. India may sooner or later be forced to revive the dialogue process again. India should therefore redouble its efforts at engaging the Pak Prime Minister but also explore the possibility of establishing backchannel contacts with the Pakistan Army. It is widely understood that India-Pakistan relations are severely crisis-ridden and that is why the relationship between the two countries simply does not improve. The 2004-2008 dialogue process was called off after the 26/11 attacks. Similarly, the renewed dialogue process was interrupted after the LoC killings in January this year. Again, just as the stage was being set for a resumption of the talks recent killings are threatening to derail it. Therefore, occurrence of crises, be they terror attacks, ceasefire violations or terrorist infiltration, can interrupt the dialogue process between the two countries at will. Both India and Pakistan are well aware of it and also know it is impossible to rule out such crises. Therefore, it is important for India to determine how to deal with them, when to continue the engagement and under what circumstances it should withdraw from engagement. In fact it is the Pakistan Army and its intelligence agency ISI and not the civil government which attempt to frustrate the dialogue process with India. They want to keep control over the Government and are the main culprit in creating obstacles in resolving the Kashmir crisis. If Pakistan’s current civilian leadership, like the previous one, is keen on improving relations with India which the country’s army does not want to see happening, India should also move forward to strengthen its ties with Pakistan and put pressure on the Pak Prime Minister to isolate the army. By not talking to Pakistan, India would ultimately strengthen the hands of the Pakistan Army which wants to damage the dialogue with India and discredit Islamabad’s political establishment both of which are detrimental to India’s long-term interests and resolving Kashmir issue. “Terrorists wearing Pakistan army uniform” carried out the attacks. If this is the case, then Pakistan and New Delhi would be doing themselves a great disservice by not talking. India should continue to engage Islamabad and make efforts to coordinate with the Pakistani Army to explore ways and means to better target the terror groups. It should send a highly specialised team of experts to Pakistan in order to explore ways to do precisely that. Calling off the dialogue with Pakistan would not make New Delhi potentially gain anything substantial. In fact the “no talks” option is not supported by any alternative as there is none. The only other alternative, other than refusing to talk, is military action against Pakistan which if carried out on Pakistani territory, under the existing balance of military power in the subcontinent, is bound to end in disastrous results for both the countries.